A crafty captain worked to free his cargo ship after its seizure by the Germans on the high seas. Joseph A. Gainard, captain of the American freighter City of Flint, hated to threaten his crew with piracy; the men were only reacting as any sailors would to the seizure of their ship by a foreign power. They wanted to take it back. Gainard wanted his ship back too, but the German boarding party was armed with automatic weapons and grenades. The 49-year-old Gainard was armed only with his knowledge of international law and his common sense. 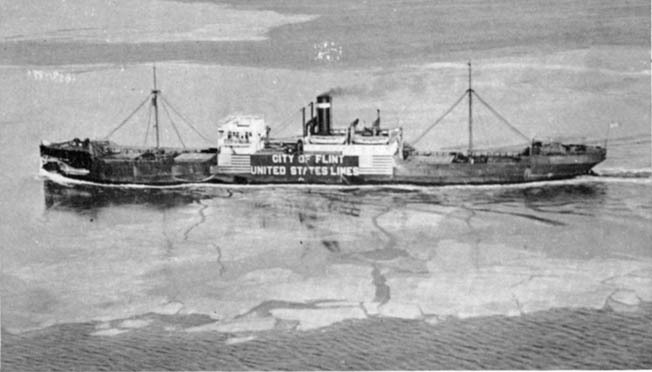 The City of Flint’s cargo, according to the Germans, contained contraband items. The vague areas and technicalities of international neutrality laws put interpretation up for argument. The Germans won the argument; they had the guns. On October 9, 1939, the 4,963-ton freighter City of Flint, six days and 1,500 miles out of New York harbor, steamed through another cloudy day on the North Atlantic bound for Great Britain. At 3:42 pm, First Mate Warren “Dusty” Rhoads, peering through his binoculars, said, “Is it a cloud?” Captain Gainard raised his binoculars to the horizon. “I don’t know,” he answered, “but it certainly is moving faster than the others if it is a cloud.” Gradually the “cloud” transformed into a ship with a battery of 11-inch guns pointing at the little freighter. 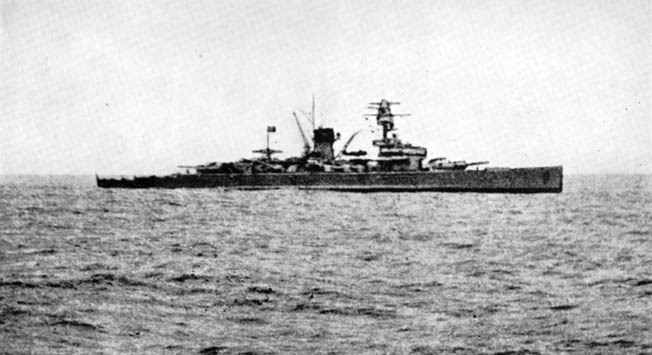 The warship, steaming at 25 knots, was the German pocket battleship Deutschland. Gainard slowed his ship and prayed the German captain would recognize the freighter as American; no other nation owned Hog Island ships. Closer inspection would also reveal the American flag painted on the ship’s side. Yet for Gainard and his crew, staring down the barrels of 11-inch guns, the sooner recognition came the better. A collective sigh of relief came from the Americans when the Deutschland swung her guns inboard. When the German ship slowed, two signal flag messages flapped on the yardarms: “YOU MUST NOT USE YOUR RADIO,” and “I AM GOING TO SEND YOU A BOAT.” She pulled up close to the American’s port quarter and lowered a small boat. Gainard went below and replaced his dungarees and sweater with his full dress uniform. 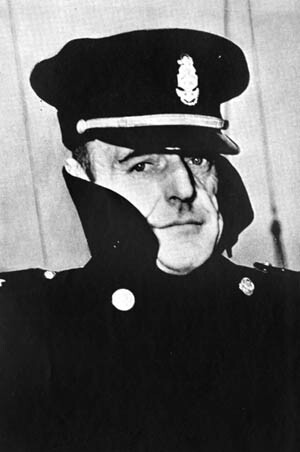 Captain Joseph Gainard, skipper of the City of Flint, manipulated and bluffed the Germans at every turn to keep his ship from being unlawfully seized by the Kriegsmarine. Gainard told him it was lubricating oil. Gainard reminded the German that the Flint was a U.S. ship, and under American law the Flint’s cargo was not contraband. Despite Gainard’s protests, the Deutschland’s captain ordered a prize crew to sail the City of Flint to Germany. The Germans also asked Gainard if he could take on 38 English prisoners picked up after the sinking of the British merchantman Stonegate. Gainard agreed, and soon a boat came over carrying 18 armed German sailors and the Englishmen. Lieutenant Hans Pushbach, an experienced merchant officer and Imperial Navy officer, led the prize crew. The German officer traced a course on the North Atlantic chart that skirted north of the Orkney Islands. Gainard shook his head and said, “It’s too dangerous.” He explained that neither of their governments would want the ship to encounter any belligerent warships that might force the Germans to defend themselves. The American drew a more northerly course. Pushbach not only agreed but told Gainard the Deutschland’s captain suggested the same course. Gainard later wrote, “He knew he could trust me on routine matters and he knew that no American on board would do the things they would like to do and on several occasions planned to do.” Gainard also knew well the neutrality laws and the international rules of the sea and hoped to rid himself of his captors peacefully within those rules before the ship could reach Germany. Now the double cat and mouse game began, the Flint trying to avoid confrontation with Allied ships and her captain trying to outsmart Pushbach. photographed in the Chesapeake Bay on its return to the United States. Gainard counted nine plots. Most plots fell apart for reasons that Gainard patiently explained to the crew. The captain continually reminded his crew about the weapons, the grenades, and that “the Germans—under international law—had a legal right to be on the ship.” Piracy charges might await the crew if they challenged Pushbach and his men. Besides, Gainard told them, their overt actions could upset American State Department efforts on the Flint’s behalf. But did the State Department know what had happened to the City of Flint? Did anyone? When the Flint’s scheduled October 12 position report to the United States Lines failed to materialize, the company (operating the ship under charter) began to worry. Soon both the line’s office in England and the State Department tried but failed to contact the ship. The German radiomen failed to fix the ship’s radio, and Pushbach barred the ship’s crew from the radio room. The shortwave radio sets on board picked up English, American, and German newscasts, but the newscasts mentioned nothing about the City of Flint. The crew sensed that the world neither knew nor cared about their disappearance. By the time the ship reached the Norwegian coast, Pushbach had become so worried about the water he decided to stop at the nearest port. Eleven days after the boarding, flying the German merchant flag and with all the American flag markings painted out by Puschbach’s men, the City of Flint sailed into the darkened harbor of Tromsoe in neutral Norway. Unfortunately for the Americans, the Norwegians watered the ship without checking the full tank the Flint had yet to tap. The Norwegian Neutrality Control and Customs officers refused to allow any Germans or Americans to go ashore in violation of Norway’s neutrality laws. The captured British sailors, however, left the ship for internment in Norway. The Norwegians ordered the Flint out of their territorial waters, and they ordered the Germans to repaint the American flag on the ship’s side. “Lieutenant Pushbach was on the spot,” remembered Gainard. “He had no direct orders from his government, our radio failure prevented that. I was just as worried as he was. We both wanted to keep the Flint safe…. He wanted to get her to Germany…. I wanted to get her free.” The two men, hoping to evade both British and German warships and a fierce southeasterly storm, chose a northerly route skirting the Norwegian coast and heading toward Russian waters. Soon after setting this course, a German radioman complained of stomach pains that suggested appendicitis. The Flint would have to put into a Russian port quickly or the sailor would die. At this early stage of the war, with the ink barely dry on the Hitler-Stalin Pact of August 1939, Pushbach decided to take a chance on Germany’s new ally, the Soviet Union. On Monday, October 23, the City of Flint sailed into Murmansk harbor flying a makeshift German naval ensign. Meanwhile, the stop at Tromsoe had alerted the world to the international situation taking place north of the Arctic Circle. On October 23, the United States Maritime Commission, the Flint’s owner, issued an official statement announcing the Flint’s seizure on October 9 and the ship’s subsequent odyssey across the Atlantic. The commission sought “further information concerning the seizure. “Later that evening, the U.S. State Department sent queries about the ship to the American consul in Oslo and to the embassy in Moscow. Photographed by a crewman aboard the City of Flint, the powerful German pocket battleship Deutschland is shown in this photo. Mounting 11-inch guns, the German raider was a major threat to Allied shipping. The world knew more about the beleaguered ship than the Flint’s men did. Listening to their shortwave radios, the shocked crew heard the famous American newscaster Lowell Thomas tell the world that the Germans were back aboard. Twenty-five minutes later, the Russian port officer returned with the German prize crew. He told Gainard to sail within 24 hours. Obviously, someone higher in the Soviet government had reversed the original decision. Captain Gainard, hearing nothing from the American ambassador, weighed anchor. After five days as a free ship, the Flint sailed out of Murmansk harbor for the ultimate destination of Germany, her captors back aboard, and the Soviet customs boat training its deck gun on the American freighter. With Pushbach on the bridge of his legal prize, Gainard had to keep the Flint away from British warships; therefore, he sailed within Norway’s three-mile limit, dodging in and out of the fjords. Suddenly, through the mist a small warship appeared—the Norwegian destroyer Stegg. Steaming to starboard, the Stegg failed to alarm Gainard. “I thought it to be friendly from the position it took—outboard instead of ahead of us.” Stegg escorted the Flint into Tromsoe harbor to meet the neutrality patrol. After issuance of the proper permits, the Flint sailed from Tromsoe escorted by Stegg and another destroyer, Aegger. That night a Norwegian minelayer, Olaf Tryggvason, joined the little flotilla. Gainard discerned that the minelayer’s captain was superior in rank to the other captains. “From his actions and the actions of the destroyers I knew they were friendly,” remembered Gainard. The ships continued south through the fjords. In the darkness of the following night, a searchlight beam flashed through the frigid air and lit the Flint’s icy deck. The Olaf countered with her searchlight and revealed a British cruiser. The Norwegians sent a blinker message in English: “We are operating in Norwegian territorial waters.” The cruiser blinked back: “Sorry. We do not wish to intrude but we would have liked to include your friend in our convoy.” Spurned by the Norwegians, the British ship and three consorts sailed out into the Norwegian Sea. When the Flint began to run out of Norwegian waters, Gainard’s hopes for freedom rapidly diminished. Therefore, when a crewman came to the captain for treatment of scraped shins, Gainard asked for a doctor from the Olaf. “The man was not sick,” Gainard recalled. “At no time was this man sick enough to require a doctor, but Lieutenant Pushbach either did not know that, or chose to ignore it.” The Olaf’s doctor and a line officer came aboard. While the doctor cared for the crewman, Gainard escorted the officer around the ship including the Germans’ quarters. “I wanted him to see everything,” remembered Gainard. Getting underway again, the ship headed south and soon passed close aboard the German cargo ship Schwaben. From the German ship’s bridge, someone yelled in German, “Do not pass Haugesund. Anchor there and see the consul.” Gainard speculated that the German government wanted to give Pushbach orders. Certainly, Berlin knew about the British cruiser lurking in these waters. Pushbach went over Gainard’s head for the first time on the voyage when the German asked Chief Engineer Logan whether the Flint could have “engine trouble.” Logan answered, “We can’t have engine trouble or any other kind of trouble unless the old man says so.” Gainard knew that if he claimed engine trouble, a valid excuse for entering port, the German prize crew could not be removed and his last chance at freedom for the Flint would be lost. Dynsor’s men escorted Pushbach and his prize crew to the Norwegian boats. The Flint’s crew showed no hostility to the Germans. Instead they helped them over the side as if they were old friends. Of course, the crew remained wary; the Germans had left before and then returned. Overjoyed, the American sailors lowered the German flag and ran up the Stars and Stripes. The German prize crew that boarded and took control of the City of Flint stands in ranks during its internment at Kongsvinger Fortress, Norway. 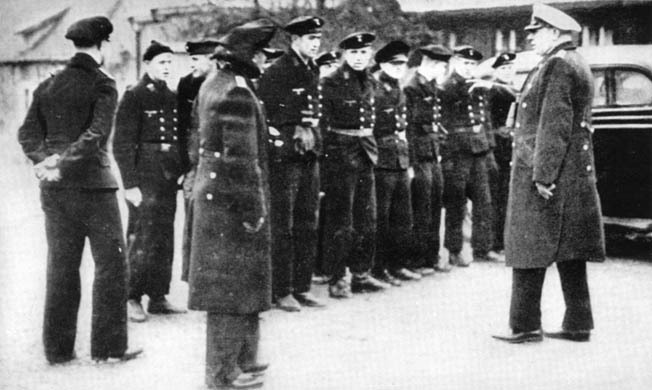 Lieutenant Hans Pushback is seen in the photograph at right. Within a few hours, City of Flint pulled up anchor, and Gainard set course for Bergen, Norway. Accompanied by two Norwegian ships, the American freighter sailed into Bergen harbor on November 4. On that day in Washington, D.C., President Roosevelt signed the joint resolution passed by Congress the previous day that would eliminate another Flint incident: cash and carry. The resolution lifted the American embargo on the sale of arms and ammunition to belligerents, who were now allowed to purchase war goods with cash and then carry them away in their own ships. Furthermore, the resolution gave the president the right to set up a combat zone in European waters that barred American vessels. In what sounded like an ultimatum, Berlin protested Norway’s actions and demanded the ship’s return. Hitler’s government soon tired of the incident and let it fade away. Gainard and his crew received a hero’s welcome in Bergen, where they left the ship for the first time since they boarded her in New York more than a month earlier. Gainard met the American consul, who prepared a radio hookup so the American captain could tell his story to the world. In line with Gainard’s efficient Yankee ways, he spoke for only 12 minutes. And her captain was no ordinary captain. Author Earl Rickard is a resident of Reno, Nevada. This article is his first contribution to WWII History magazine. Tags Battle of the Atlantic, Kriegsmarine, Nazi Germany.